Monkeys come in all shapes and sizes, just like their onesie friends! Gorilla costumes are attracting the alpha males and cheeky chimp costumes are perfect for the office joker. Orangutan onesies are raging for redheads, baboons are leaving people red-faced and silly monkeys are everyone’s friend. No matter which one you choose, the classic monkey onesie is always a hilarious choice. As well as looking funny, this all in one is also unisex, making it perfect for men and women of all ages. 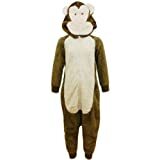 Monkeys have always been a character synonymous with fun, making this onesie perfect for themed nights out and parties. You may want to turn up in the city centre with your monkey mates, just hanging around. Or you may decide you’d rather be the lone chimp, jumping from bar to bar. Whatever you decide, you’re guaranteed to attract attention, as well as a few bananas! The cute face and cosy fit also make the monkey onesie perfect for relaxing and sleeping in. Whether you have your hood up because you look more like Johnny Vegas than the PG Tips Monkeh, this onesie is perfect with a warm cup of tea and a bit of TV! We can’t deny that monkey onesies are adorable for babies and kids too. Your own cheeky monkeys may be driving you wilder than the jungle, but onesies make them just too cute to stay mad at. It may be stereotypical to put kids in costumes and dress them up as animals, but this is one cliché that needs to stay. Less hassle than pyjamas and a much sweeter option, the monkey onesie acts as both clothing and a friendly face for young ones at bedtime. Why not dress the whole family up for a night of monkey madness? Welcome to the jungle!